We love pancakes in this house, I put one of my favourite recipes up in a previous post for banana and oat pancakes but pancakes don't just have to be for breakfast or pudding, oh no I've found them great to have at lunch or dinner time too, they are quick and easy to make and the same as sweet ones, you can whatever filling you fancy in savoury pancakes. I recently found a recipe on Mumsnet and decided to give it a go, adding a few of my own ingredients, I opted for chicken, sweetcorn and cheese filling …. * Sieve the flour, baking powder and salt into a large bowl. * Stir in the chicken, sweetcorn and cheese. * In a jug beat the egg and then whisk in the milk. * Gently stir into the dry ingredients to form a thick batter. * I use fry light to coat a frying pan but you can use any dort of oil or melted butter. * When heated drop a large spoonful of the batter in the pan, cooking for around 2-3 minutes before flipping and cooking for a fiurther 1-2 minutes. This mixture makes around 4 large size pancakes. I served it up with a spinach salad. 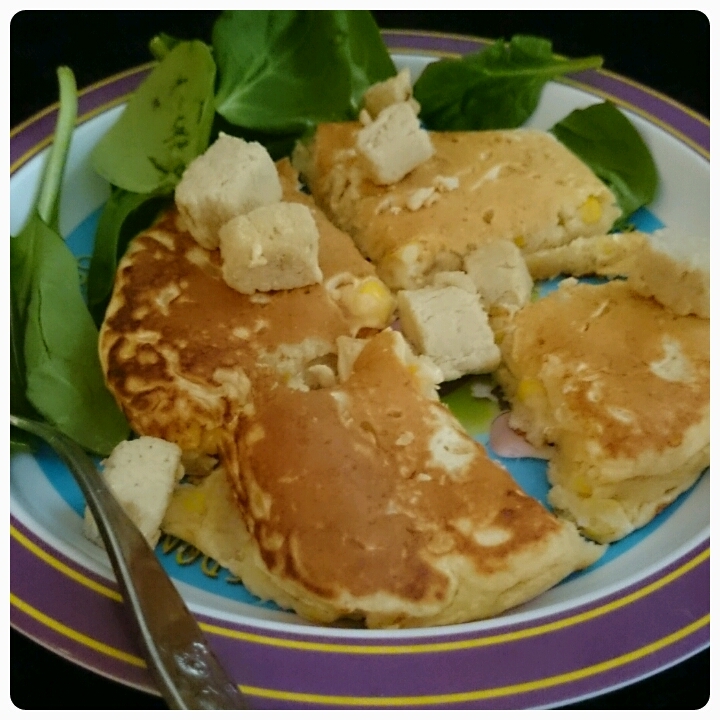 What filling would you put in your savoury pancake? ?